The RIZMY Wrap-Up: Which Brands Came Out On Top? DigitalCoCo recently unveiled the winning brands at the First Annual RIZMY Awards at the premier Foodservice Digital Marketing Summit (FDMS), co-located with FSTEC NexGen in Phoenix. This is the first awards ceremony of its kind. The RIZMYs applaud foodservice brands - both multi-unit and independent, ranging from QSRs to fine dining - that are rocking social and digital media. The eight awards include: Overall Brand of the Year, Most Loved Brand of the Year, Mobile Brand of the Year, Most Influential Brand of the Year, Location-Based Brand of the Year, Digital Executive of the Year, Digital Innovator of the Year, and Social Chef of the Year. 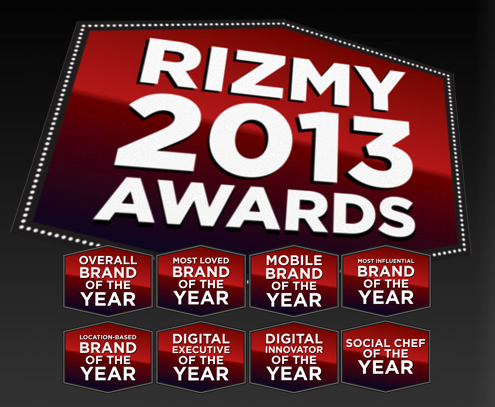 In case you’re not up-to-speed, the RIZMYs are not hand-selected. Instead, they are measured by DigitalCoCo’s proprietary Restaurant Social Media Index (RSMI), the largest collaborative resource of restaurant industry data in the world, tracking more than 7,500 brands, 60 million U.S. consumers and 100 million global consumers. Additionally, more than 5 billion location-based actions and more than 30 billion targeted actions contribute to sentiment, engagement, influence, location and mobile data in the RSMI in 2013. To get the full scope of how the RSMI works, you can dive deeper here. Red carpets were rolled out at the beautiful Talking Stick Resort, and amidst a live band, DJ, hors d’oeuvres and hundreds of attendees, five finalists and the winners were (finally!) revealed. (To check out the full list of nominees for each award, click here. Additionally, you can check out our recent RIZMY coverage here.) For those in attendance, there was a surprise element to add to the fun: a mini-WebTV, talk show format series digital brand “roast,” created by Foodable Network, spoofing some of the best branded digital marketing efforts from the past year. Some of the brands included were Applebee’s, Taco Bell, Red Mango, and many more. And now, for the moment you’ve all been waiting for: the first-ever RIZMY winners! Digital Executive of the Year: This is the only award in the line-up not based on RSMI data. These leaders, dubbed The Magnificent 12, were selected by the RSMI analyst team, who pored over several execs. The 12 finalists who made the short list are all social rockstars and have the ability to see the future of digital marketing for foodservice brands. In the end, Dan Kim of Red Mango came out on top. Social Chef of the Year: Also a first for the foodservice industry? Highlighting social chefs, those who connect to their guests not only inside their establishment(s), but on social media, as well. The Social Chef concept goes way beyond that, and is ultimately changing the way business is done. (You can read all about The Social Chef here.) The five finalists were Marcus Samuelsson (NYC), Giorgio Rapicavoli (Miami), Stephanie Izard (Chicago), Spike Mendelsohn (DC), and Todd Erickson (Miami). Congratulations to Chef Todd Erickson, who beat out the competition. Click the photo below to view the gallery.